With no caste base for Congress in UP, Rahul Gandhi is raising farmers' issues. Will it yield a win? 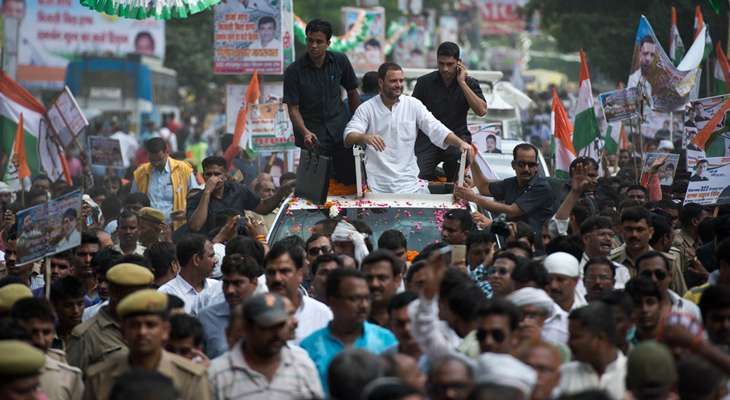 Congress vice-president Rahul Gandhi's Kisan Yatra in Deoria may have been shrouded in the khaat controversy, but it does seem to have set the political agenda for the upcoming Assembly polls in UP. While rest of the parties in the fray are desperately trying to make caste the focal point for the next elections, Rahul has stumped his opponents by playing the farmer card. Whether he succeeds in reversing the Congress' fortunes with this strategy in India's most politically vital state is a thing of the future, but the Gandhi scion has been successful in raising the issue that had been put on a back burner by other political parties in previous election campaigns. The absence of a new crop of farmer leaders in the Hindi heartland has given the Congress an opportunity to fill this void that it feels would pay dividends not only in the state elections but also in the 2019 general elections. Even Rahul's detractors, who had earlier ruled out any revival of the party in UP, are calling it a political masterstroke which they believe will force the Congress' opponents to rethink their strategies and step up their efforts in wooing this crucial segment that once held considerable influence in determining who ruled UP. Lucknow based prominent political analyst, Dr Ramesh Dixit, had a month back dismissed any chance of the Congress' resurgence, but he too is excited with Rahul raising farmers' concerns. "The Congress has intelligently raised farmers issues which are hard to ignore. Ultimately, every party would be forced to react and respond. He is added a new dimension to UP politics. It will certainly translate into votes and the Congress suddenly is one of the most talked about parties in the state," said Dixit. Calling the controversy around the whole "Khat loot" a non-issue, Dixit said that if Rahul is doing good work, "he should be given his due". However, others are still apprehensive about the Congress' ability to use this momentum to its advantage. Citing lack of organisational structure on the ground, AK Verma, who teaches political science at Kanpur's Christ Church College, points out that agriculture remains a crucial political agenda and says that it can only be done if the party has the wherewithal to do so. "Raising a political agenda means first floating it and then cashing on it, but with the Congress' dismal organisational structure, it seems difficult. If you come up with a brilliant idea and can't sell it then others are bound to use it to their advantage. Rahul has taken the lead, but will he be able to hold on to it and even exploit it is debatable in prevailing circumstances," Verma added. He disagrees that the Congress has set the political agenda which he considers includes a wider gambit of issues. "It is an electoral agenda and caste still remains the pragmatic aspect of state politics which just can't be ignored," he added. Elaborating on it further, he says the state is terribly divided on caste lines and it is difficult to make inroads in these closed caste groups forcing the the Congress to take up the class issue. Calling farmers issues still a major factor in UP's politics, Verma said what Rahul is trying to do is not new and several prominent leaders have tried to milk it to their advantage, but failed. Citing examples of Chaudhary Charan Singh and Mulayam Singh Yadav, he said that they too tried to homogenise farmers from different parts of UP and were largely unsuccessful. But others differ from this viewpoint and credit Rahul for using the space abandoned by other mainstream political parties. Renowned food and trade policy analyst Devinder Sharma points how in the last two three decades farmer leaders have increasingly become irrelevant. "They are heroes at local level and zero at national level. Their politics is all about securing a party ticket and once they get one, farmers are soon forgotten." Complimenting Rahul for placing his finger on the right nerve, Sharma said that farmers want to look up to someone who can raise their concerns and address them. 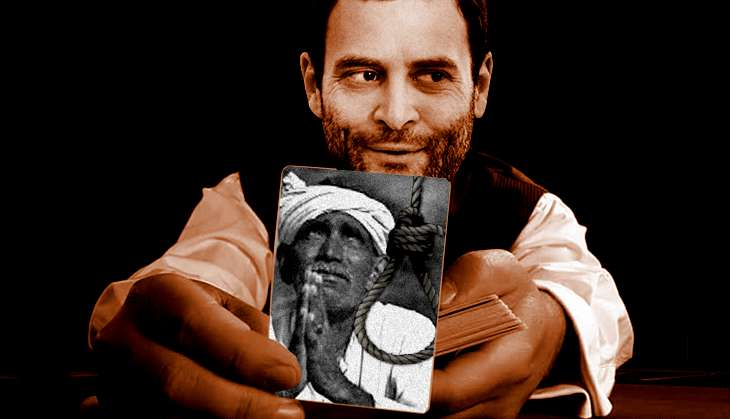 "Yes, every party will now rush to cash in on the farmer card, but Rahul Gandhi has certainly taken a lead. I hope the Congress just doesn't look at this for immediate gains, but as a well thought out strategy to revive its fortunes across the country," said Sharma. However, Rahul's political opponents are not so kind in their words and blame the Gandhi family for all the ills that the farmers in this country face. Calling it political opportunism, they say this is not the first time that the Gandhi scion has raised this subject before elections. BJP was particularly harsh in its comments and blames the Nehru-Gandhi family for neglecting farmers' issues since independence. "These are crocodile tears being shed by Rahul. Out of the 70 years since Independence, Congress has ruled for 60 years and they are the ones who should take the blame. Why is he raising this issue now? He wants to exploit it for electoral gains and anyways no one takes him seriously. So, we are not bothered by his theatrics," said BJP leader Dr Dinesh Sharma who is also the Mayor of Lucknow. Samajwadi Party leader Ashok Yadav too criticised Rahul's timing for raking up this issue and said he should not be taken seriously since Congress is nowhere in the race. "They don't have a farmer face and even Rahul doesn't match the profile of someone raising farmer's issues. Farmers know this is political opportunism. The issue is right, but not his timing and intentions," said Yadav. History suggests that Rahul's efforts to woo this particular class did not yield desired electoral gains that he had hoped for. But it is different this time and much of the credit goes to star strategist Prashant Kishor's advertising blitzkrieg that has created a certain buzz about the Congress. And he still has one more ace up his sleeve that could be yet another game changer which would be out once Rahul's hectic 20-day yatra gets over. The Congress has planned an extensive campaign schedule for Priyanka Gandhi and if she too succeeds in touching the right nerve, Congress could witness an upsurge in its popularity which should intimidate other political players in the fray.